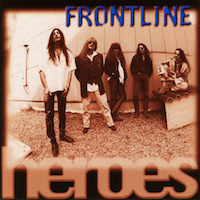 FRONTLINE is a Melodic Heavy Metal band that was founded in 1989 by Robert Bobel. “Heroes” was the band’s second album from 1997 and was originally released only in Japan, until now. AOR Heaven Records have officially released “Heroes” as of May 25th 2018 in an edition limited run of only 1000 copies. The album has been remastered for this special edition by guitarist/keyboardist Robert Bobel. I was not at all familiar with FRONTLINE prior to listening to my review copy, but after researching the band, and reading in various places about how sought after these recordings were, I was excited to dive into this release. The album opens with “Our Love”, and I actually thought I was listening to TYKETTO. I don’t consider that a bad thing. TYKETTO was the last real Hair Metal band that I really liked from the ‘90’s. So, we’re off to a really good start. Next up, the album’s title track, “Heroes” and if anything, we’re really consistent. Smooth, guitar heavy power ballads, with skillful musicianship backing up vocalist Stephan Kammerer. “Moving Closer”, and “Break My Heart Again” follow, and now it just seems like it’s the the same song over and over. Somewhat boring, yet it’s still enjoyable. There’s absolutely nothing wrong with the songs, they just don’t grab me like I wanted them too. “On The Run” was my favorite track, and sounds as if it would have been and should have been the natural radio single to have been released. It’s easily the strongest track on the album for me. The remainder of the album is again, enjoyable, but uninteresting. The band obviously has the talent, I just wish they had pushed more boundaries, and taken more chances. Overall, for me, “Heroes” and FRONTLINE in general are likeable. Unfortunately, there is nothing innovative, nor all that memorable happening here. With that said, if this is an album you’ve been longing for, remember, AOR Heaven Records has limited this release to only 1000 copies. If you want it, I wouldn’t wait!